This unusual folding caravan came along in 2006, and was bought from a couple who were giving up camping in caravans, to instead use a small Bambi motorhome. I no longer own it, sadly, but this is the story of its discovery. The story goes that around ten years earlier, they had been looking to buy a modern folding 'van to tow behind their diminutive 1.4 Fiat Punto. The salesman at the caravan dealership was doubtful that this small car could tow any of the modern folding 'vans with any degree of safety, ease, and so on. However he did have an alternative - tucked in the corner of the yard, surrounded by a sea of modern fibreglass offerings, was this funny old folder that the boss of the dealership had bought for himself, on a whim. The couple in question weren't collectors of old things particularly, didn't own any classic cars or similar, and were not really in the market for a classic caravan. However they saw the potential in this curious old Wessex, and decided to give it a whirl. Despite living in a very smart little town, they soon took to using the little Wessex, even with its cosmetically-challenged exterior. Several family holidays were undertaken, including a trip touring France with it. Their final holiday in this caravan was in the August of 2006, after which they decided to use the Bambi motorhome instead. I heard of the folder via this website, and decided to offer it a home, despite my other half's slightly muted excitement at the prospect. I treated her to an overnight camping exercise in my Portafold some years previously, and I don't think she was in any hurry to repeat the experiment. So off we toddled, and easily found the caravan, stored in the bottom of the owner's leafy garden. Once the intricacies of the folding mechanism had been explained to me, we hooked up (having remembered to fit a small 1.5" towball before I set off) and headed back up north, with the Wessex rolling along behind. In recent times it had been treated to a new axle, wheels and tyres, and the old jockey wheel replaced with a modern job, complete with inflatable tyre. The caravan towed very well really, and we had a steady run back. Next day, we gave it a good clean and inspected our latest buy. Condition wise it isn't too bad really. The fibreboard sides will need some localised repair here and there along the lower edges, and the floorboards at the extremities will need a little tlc. The roof, fitted with a modern skylight, will need stripping and repainting, just like the rest of it, but should be serviceable nonetheless. I re-fitted the original cast iron jockey wheel too, which looks a lot more in keeping with this old 'van. The previous owners included a new set of side curtains with the van, and still had the original awning and poles that affix to the door end of the 'van. 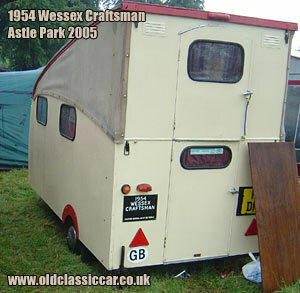 This photo shows a 1954 Wessex Craftsman, seen at Astle Park in 2005. The 'van I have has a handpainted badge on it proclaiming that it is a Wessex Fold-A-Van. Is it actually a Craftsman though, as shown above, or were earlier examples known as the Fold-A-Van? answers on a postcard! 'Er indoors is still a little dubious about kipping in a dinky vintage 'van, and I'm not entirely sure that she'll come around to the idea ever, but time will tell as they say. As mentioned, the fixed side panels and roof are made of some kind of fibreboard type material - which makes it all the more remarkable that the caravan has survived this long in my mind. The roof hinges at the front. To raise the roof, you unclip two overcentre clips at the rear, and lift the roof upwards, at the same time pulling the upper rear section up into place (including the top half of the stable door). The roof is then sat back onto the top of the rear panel, and the clips put back. The exposed sides are then filled in by re-fitting the canvas sides, using a number of poppers on either side. Job done. Weight is kept down thanks to the use of perspex windows - no heavy glass here! Folding down is the reverse of this process. I've had a good look around online, but cannot find much information at all on folding caravans made by Wessex. In the image archive elsewhere on this site, I've got a photo (reproduced here) of a similar caravan spotted at Astle Park back in 2005, but as yet I've not found any references to these late 1940s/early 1950s 'vans on other websites. This one is believed to date to 1949 - the previous owner says that he found a date somewhere (probably on the chassis) but couldn't remember exactly where. The caravan is parked at a friend's place for the timebeing. Happily though, a few years after parting with the Wessex, another oddball caravan from the same era turned up. Details of its discovery may now be found here.